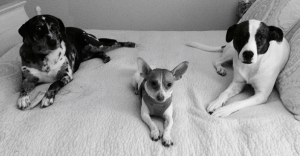 Vicki, Maggie, and Buster are all terrific dogs who were adopted from shelters and rescues by two amazing owners. Vicki is a 4 year old Catahoula mix, who is fearful and uncertain with basically anyone other than her two owners. She barks at guests who visit the home and doesn’t listen to her owners commands when she is afraid. 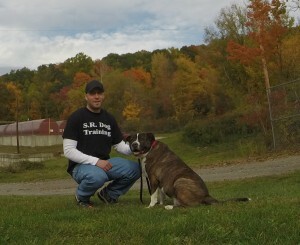 Maggie is a 4 year old Pit mix that is friendly, obedient, and great with dogs. She is a great companion for Vicki, as her presence makes her feel more comfortable and confident when around strangers. Buster is a 2 year old Chihuahua mix that his owners just adopted from a local rescue. This family contacted me for dog training in Bedford Hills NY just prior to adopting Buster, their third dog. They are very smart dog owners who understand how important it is to be proactive with proper training, than it is to be reactive. They wanted to properly introduce Buster into their household with their two previous dogs. Above and beyond that, they knew it was essential to have obedient and well-behaved dogs. Not only will this reduce their stress and make life easier for them, but it also provide Vicki, Maggie and Buster more freedom. The dogs will be able to go with their owners to more places and be a part of family activities as a result of their increased obedience and improved manners. We started all three dogs on my adult dog training program. This is based on sound dog training principles and the approach I have used with hundreds of dogs. This allows me to help all dog owners successfully train their dog to be reliably obedient level, regardless of how many dogs they have or their dog’s breed, age and size. “We have three rescue dogs and three cats, so things were a little out of control. We contacted Steve shortly after adding a 3rddog to our family. Each dog has a unique personality and his/her own issues that we wanted to deal with. Our newest addition Buster (Chihuahua/Jack Russell) likes to introduce himself with barking and nipping at people’s pant leg. 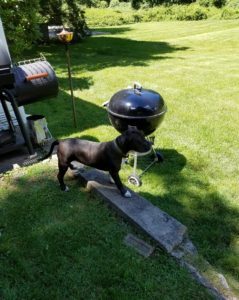 Maggie (Pit Bull mix) is a happy, loving dog and likes greeting people by jumping on them and nearly knocking them over. Vicki (Catahoula Leopard) is fearful (will not let anyone besides us pet her) and barks uncontrollably. Though Maggie and Vicki are generally well behaved, when we had guests over they just didn’t listen and Buster just added to the excitement. It felt like chaos and it got to the point that we didn’t want to invite anyone over. Steve came over that first Sunday morning (we’re very grateful for his flexibility) and he was greeted by the pandemonium and Buster latched onto his pant leg as he walked into the house. He began by teaching them a basic sit command (by the way training 3 dogs at once is no easy task). At the end of the first lesson he left us with instructions on how to carry out training for the week and followed up with some supportive articles through email. When Steve arrived the following week for lesson 2 he was greeted with the same craziness as week 1 but he calmly continued on with his lesson. But by Steve’s last visit, Buster would just come and sniff, Maggie greeted with a wagging tail and all 4 paws on the ground and even Vicki came over for a hello! Steve gave us a strong foundation and put us in a place to succeed. Steve helped us achieve our goal of less chaos and more. 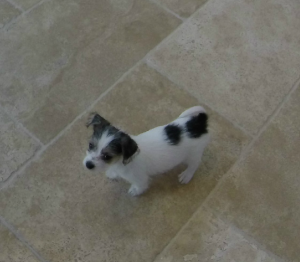 Rocco is a 10 week old Maltese/Jack Russell puppy. He has the distinction of being my smallest client to date, weighing just 3 pounds! Rocco’s owner contacted me for dog training in Bedford Hills NY. His owner’s first priority was to make sure that Rocco was playing appropriately with their current dog Scout. Scout is a 12 year old senior, so his owners were hoping that Rocco’s puppy energy and companionship would revitalize his spirits. Assessing proper dog play is important, so I supervised several of Rocco and Scout’s play sessions. Their owners were relieved to hear that their play was not only appropriate, but both dogs were thoroughly enjoying each other. Proper dog-to-dog interactions are critical for multi-dog households. You can’t have roughhousing and fights over food and toys between dogs that live together. If you are unsure or concerned with your dogs’ interactions, contact a qualified professional who can help you. In conjunction with Rocco’s play with Scout, we also looked to address his puppy biting, obedience training, and housebreaking. Rocco was a very bad foot biter. He would chase and bite everyone’s feet, regardless if they were wearing shoes and socks. By using my Puppy Training Program, we were able to solve this challenging issue very quickly. I have two very successful housebreaking approaches: One for dogs that go outside to the bathroom and one for small dogs whose owners want them to use “wee wee pads” in the house. Due to Rocco’s extremely small size, his owner opted for wee wee pads. Teaching a dog to successfully use pads is a struggle for many owners. I have been called in to help a number of clients who ran into difficulty with wee wee pad housebreaking. As a result, I help make this process simple and easy for owners, while clearly communicating to the dog what they need to do. Small dogs are notorious for being difficult to obedience train. However by using sound dog training principles, we are able to train dogs of all breeds, ages and sizes. Rocco is my smallest dog training client ever, but was no exception, as we successfully taught him: Sit, Place, Come, Drop It, and Lets Go (an informal heel command).